We are only one mile south of Chimney Rock Village and State Park. Pine Gables now has free WiFi for all our cabins! Historic Cabins on Beautiful Lake Lure! Located on the grounds of the old inn at Pine Gables we have two simple and rustic log cabins built along the banks of Lake Lure, and one wood frame cabin. Our property, Pine Gables Historic District, is listed on the National Historic Registry. These historic cabins offer unique lodging for the adventuresome traveler, as did the old inn when it was a stagecoach stop in the 1800's. Explore beautiful Lake Lure in a canoe while staying in one of these charmingly rustic, historic cabins. All our historic cabins are pet friendly. One of Three rental cabins that is not a log cabin, the 'Wandering Bear' Cabin has one bedroom and one bath, a full kitchen and a large living room. It is very comfortable for two people. The front porch is furnished for dining and relaxing, and is enclosed for your privacy. This cabin has a washer and dryer. 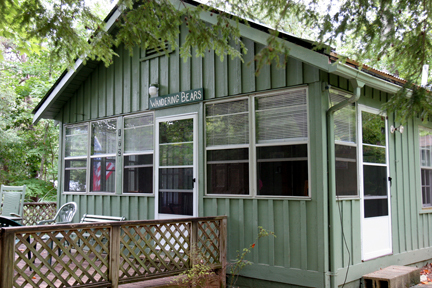 The 'Wandering Bears' Cabin is pet friendly. This cabin was originally built in the early 1940's to house the camp counselors when camp "Tally-Ho!" was on the property . The owners love bears (real and plush) and love to travel, so the name is for everyone that shares our passion for both. The smaller historic log cabin, called 'Tootsie's Cabin' has one bedroom and one bath. With a sofa sleeper in the living area, it can accommodate 4 people (the sleeper sofa is recommended for children only). 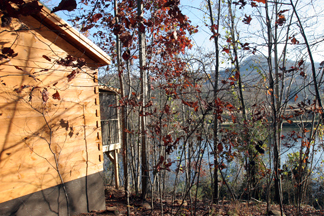 This lakefront cabin has an open porch with views of Lake Lure and the surrounding mountains. Tootsie's Cabin is pet friendly. "Tootsie" was the nickname for the current owner's grandmother. Tootsie operated Pine Gables Cabins for many decades. 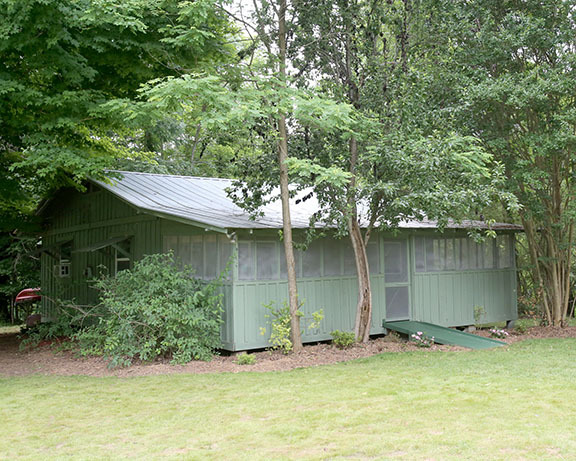 The larger historic log cabin, 'Jim's Cabin' has two bedrooms and one bath and, with a sofa sleeper in the living room can accommodate 6 people (the sleeper sofa is recommended for children only). 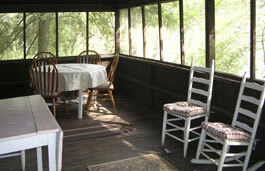 The screen porch is furnished for dining and relaxing and also overlooks Lake Lure and the mountains. Jim's cabin is pet friendly. This lakefront cabin is named for Jim Washburn. Jim was Tootsie's husband and he built this cabin in 1947. Formerly known as the "New Log"
Raven's Roost Cabin has two bedrooms and sleeps four. Evergreen is a charming, pet friendly, cottage that will comfortably accommodate 4 adults and 2 children. This cabin is located at 109 Boys Camp Road right across the street from the Flowering Bridge and one half mile from Pine Gables. (It is NOT on Pine Gables property). It is a nice (off- road) walk to the town beach, marina, and the park. Occupants are welcome to use all the Pine Gables amenities including use of the canoes, horseshoes, walking dogs at our fields and fishing at the lake and our private ponds. The Master bedroom has a queen bed, the second bedroom has a full bed. There is also a sofa bed in the living room. Evergreen has a washer & dryer. The Lake Lure beach is a short walk away. The Flowering Bridge is across the street and it is only one mile from the entrance to Chimney Rock Park. 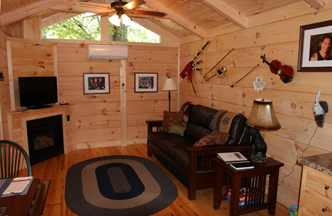 Each cabin is simply but fully furnished with most everything needed for a couples getaway or a family vacation. They can be rented separately since they are far enough apart to ensure privacy, but are within walking distance of each other making them also perfect for a family gathering. There are picnic tables and an outdoor charcoal grill nearby for guests to enjoy and ample room for children to play. 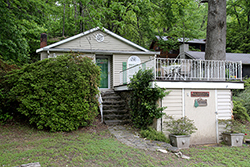 It is a short walk from each cabin down to the pristine waters of Lake Lure where you can wade, swim and fish off the shared dock or explore the waters of Lake Lure in a canoe with the beauty of these majestic mountains rising all around you. Note: A North Carolina fishing license is needed when fishing off the dock on Lake Lure. 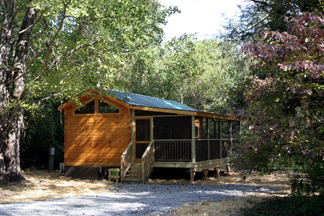 * Tootsie's Cabin has one bedroom, a sofa sleeper and one bath. Sleeps 4. * Jim's Cabin has two bedrooms, a sofa sleeper and one bath. Sleeps 6. * Each cabin is near the lakefront with mountain and lake views and comes with a canoe, paddles and life vests. It is North Carolina law that everyone in a canoe must have a life vest in the canoe and that children under 13 must be wearing a life vest at all times. * Fully furnished kitchens, except no dishwashers. * Cable TV with DVD player in living area of each cabin. * Jim's, Tootsie's and Raven's Roost Cabins have Window air conditioning units, and Wandering Bear has central heat and air. * Towels and Bed Sheets, . * Sorry, but there are no laundry facilities at Jim's or Tootsie's Cabins. * Picnic tables and outdoor charcoal grill. 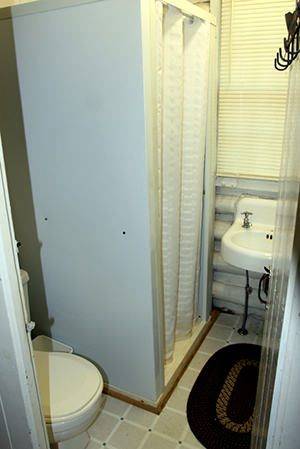 * Each cabin has a bathroom, however the bathrooms in Jim's and Tootsie's Cabins are quite small. The Large White House at Pine Gables is not for rent but does have plenty of history. Click here for more information. All our new one bedroom log cabins are perfect for couples! ALL new cabins feature a HOT TUB, fireplace, gas grill, washer/dryer, dish washer, full kitchen & bath, and comfy queen bed. Three of our new cabins are Pet Friendly, so invite your furry friend too! Romantic, Private, Wooded, "Getaway" Cabins. 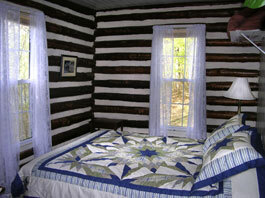 All the new Pine Gables rental cabins feature queen beds with plush pillow-top mattresses. 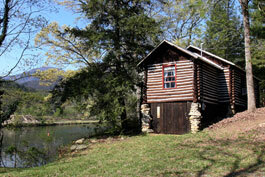 Ceilidh Cabin (pronounced KayLee) is built beside an old roadbed that before Lake Lure was built was NC Road 20. It has both lake and mountain views. Ceilidh Cabin is pet friendly. "Ceilidh" is a Gaelic word for a small traditional music party at someone's home. 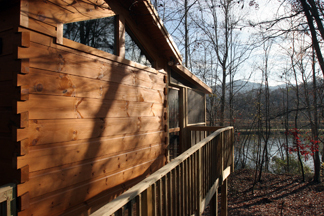 Owl's Nest Cabin is built on the banks of Lake Lure. From the screened porch you can see Lake Lure and the surrounding mountains. Owl's Nest Cabin is pet friendly. One night while Robin and I were trying to come up with names for our cabins, we heard a screech owl. At that point we both decided Owl's Nest was a perfect name. 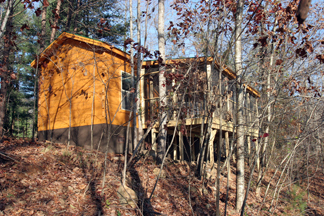 Click Here for more Photographs of the Owl's Nest Cabin. 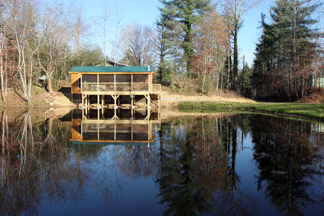 Duck Pond Cabin is built next to a small private fish pond that is a favorite with the local ducks, geese and Great Blue Herons. All the New Cabins will be cozy log cabins for two. They will each have a hot tub for couples to celebrate a honeymoon, birthday, anniversary in a romantic honeymoon cabin. Our North Carolina cabin rentals offer an affordable honeymoon package that includes spa treatment at the Lake Lure Inn. 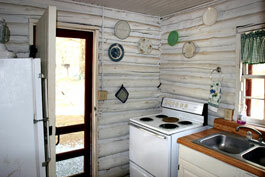 Pine Gables Cabins strives to use low impact or renewable materials when at all possible. When available we use Energy Star appliances. Our luxurious new bed linens are certified organic. We are in the process of becoming as energy efficient and eco-friendly as possible. We are adding insulation and replacing old appliances with Energy Star rates fixtures (as we can afford them). Of course our new front load washer/dryers, heat pump (21 SEER), dishwashers and televisions are all Energy Star rated. We are replacing our bed linen with certified organic sheets. When possible we have purchased local made furniture. We're not totally green, but we are headed in that direction! Any suggestions would be more than welcome. 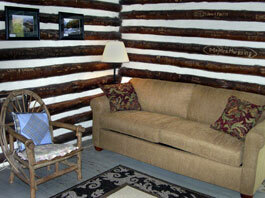 * All new romantic log cabins have one bedroom and sleep two adults. 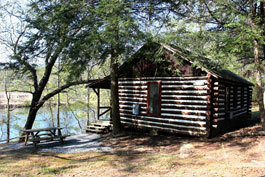 * Each cabin is lakefront or near the lake with mountain and water views and comes with a canoe, paddles and life vests. It is North Carolina law that everyone in a canoe must have a life vest in the canoe and that children under 13 must be wearing a life vest at all times. 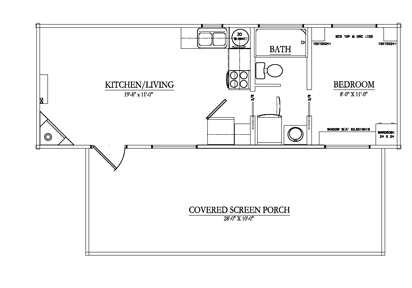 * Fully furnished kitchens, including dishwashers! * Energy Efficient Heat Pump for heat and air conditioning in each cabin. * Luxurious Organic Bed Sheets. * Front loading energy efficient washer and dryer. * Propane grill on your very own screened porch. The tradition of welcoming guests to Lake Lure continues at Pine Gables cabins. Come visit our beautiful lake and mountains and leave refreshed and restored. 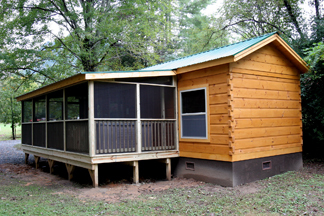 Our new cabins are built by Green River Cabins. These are great folks to work with.